"Go to app store" shortcut. Make sure you have the .NET framework installed. Extract the .zip file somewhere, you won't be able to move the .dll file later so put it somewhere out of sight. Run install.bat (you have to be admin). To uninstall, run uninstall.bat. You might need to restart explorer to delete the .dll. 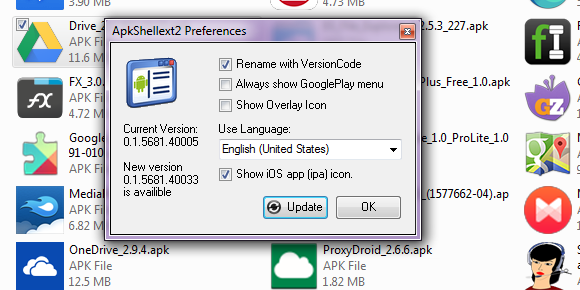 ApkShellExt2 is maintained by kkguo and is licensed under the MIT License. Website by Thanasis Georgiou.